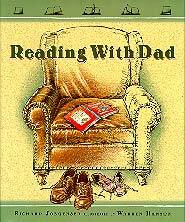 CM Magazine: Reading With Dad. Richard Jorgensen. Illustrated by Warren Hanson. Minneapolis, MN: Waldman House (Distributed in Canada by Stewart House), 2000. 40 pp., cloth, $24.99. ISBN 0-931674-41-7. Preschool-grade 2 plus adults / Ages 4-7. The Cat In The Hat, my father, and I. It's just before bed and I'm warm and dry. These rhyming couplets open a tender poem about a lifetime love of sharing books and reading. The daughter who narrates the poem tells of her early years with her dad when they shared favorite picture books and rhymes. Later, after she goes to college, they share classic stories over the phone. The daughter continues the cycle of reading with her own children, thereby creating another bond of love and pleasure. Finally, when Dad is in his twilight years, father and daughter share Psalm XXIII. The simple rhyming scheme also has a patterned refrain which ends with the words, "reading with Dad," and this adds to the rhythm of the poetry. The book is very similar in theme and presentation to the award-winning Waiting for the Whales by Sheryl McFarlane (Orca, 1991). In both books, the cycle of life is explored, and the relationships within families develop through shared activities. In format, the books are similar in size, and they both use tan colored frames around the illustrations. 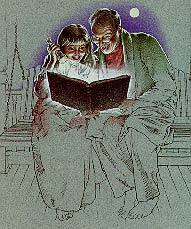 In Reading With Dad, the illustrator has employed realistic graphite and colored pencil illustrations on colored paper. The use of chiaroscuro is especially well done, and the soft hues perfectly complement the gentle text. An additional surprise is the creation of "flip book" illustrations on the right hand borders which, when flipped, show book pages turning! This attractive book could easily be read at family literacy or church events with parents, teachers and children. It features a theme family literacy practitioners would find very appealing and useful in their work. Lorraine Douglas heads Youth Services at the Winnipeg Public Library.